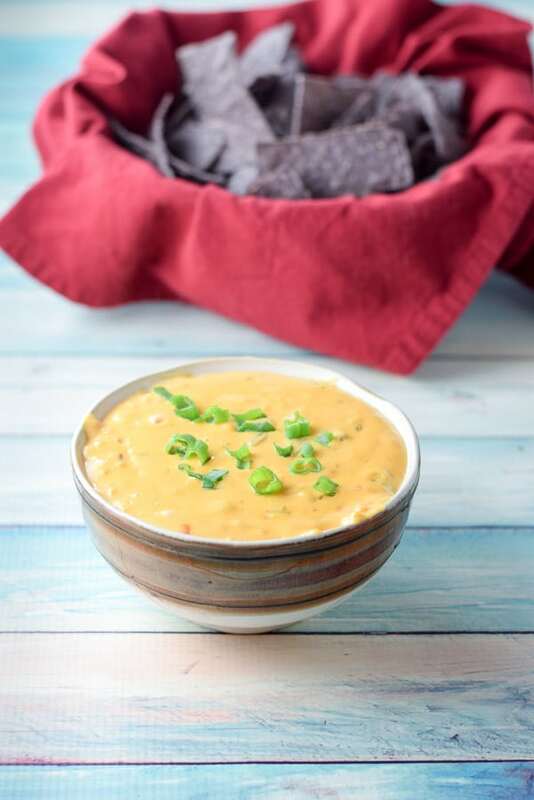 Everyone will gobble up this chile con queso dip! It is so cheesy and scrumptious that you will definitely have to save a little of it in your kitchen so you will get your fair share before your guests eat it all. I love chile con queso. The first time I ever had it was at that Mexican restaurant where I worked many moons ago. When I first tasted it, I thought to myself, Where has this golden taste treat been my whole life? Really! Who wouldn’t love a melted cheese dip to stick her tortilla chips into? Especially when it has sautéd onion, chopped up chile peppers, and some garlic in it! One of my guilty pleasures is the cheese I use. If you are a food purist, shield your eyes and skip the next sentence. I use Veleeta cheese. That cheese is one of my guilty pleasures. I was standing across from the manager who was filing in for the fry cook. The fry cook was responsible for anything that was deep fried, as well as all the appetizers. I had a good, easy relationship with the manager, who’s name is Brad. I was ribbing Brad about how long the nachos were taking. I had a bowl of chile con queso on my round tray and I was urging him to get me the nachos. As a joke, he flung a plate of french fries onto the warming shelf before he turned to grab the nachos. That plate of fries didn’t stay on the shelf. No siree. It slid off and landed on my tray. The way it landed caused the tray to tip and the bowl of queso to fly up into the air … landing on my face! The bowl then fell off and landed on the floor. When Brad saw what happened, he gasped, ran around the counter, took his hand and swiped as much of the queso off of my face as he could. Lucky for me, the queso wasn’t hot, so it didn’t really burn me. I actually thought the whole thing was quite funny. I was drenched in that yellow creamy wonderfulness and had to change my shirt and apron. My face was a little red, but I was no worse for wear. And as a perk, I did get in a few licks of the chile con queso in, before Brad jumped to the rescue. Here’s another chile con queso recipe I make, this time with beef. Add cubed Velveeta, the drained can of green chiles and cumin to the pan. The cheese doesn’t take long to melt but you must stand there and stir it or it will burn. Once it’s all melted, scrape all that goodness into a serving bowl! To garnish, I cut up some scallions for color and sprinkled them over the chile con queso. Mmmmm. Delicious! Christopher happily volunteers to help me photograph the queso. 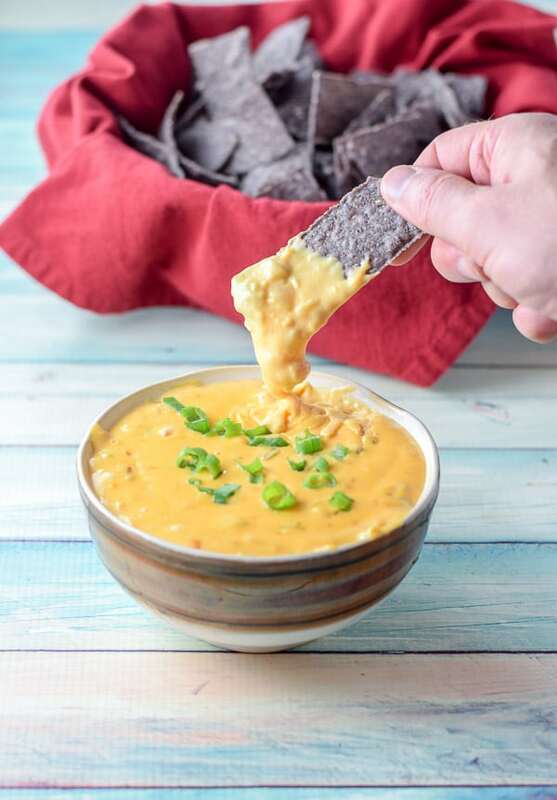 He grabs a chip and dips it in the cheesy goodness. Although that’s a nice shot, I ask Christopher to dig deep! There we go! That’s what I’m talking’ about! Look it at how cheesy that is! 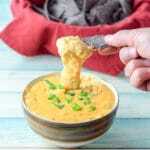 I hope you enjoyed this chile con queso recipe! Leave me a comment and tell me what your favorite appetizer is! If you’ve tried this Udon Noodle Soup recipe, I’d love the know what you thought about it in the comments below. I love hearing from you! You can also FOLLOW ME on FACEBOOK, TWITTER, INSTAGRAM and PINTEREST to see more of my delicious food and delightful cocktails! 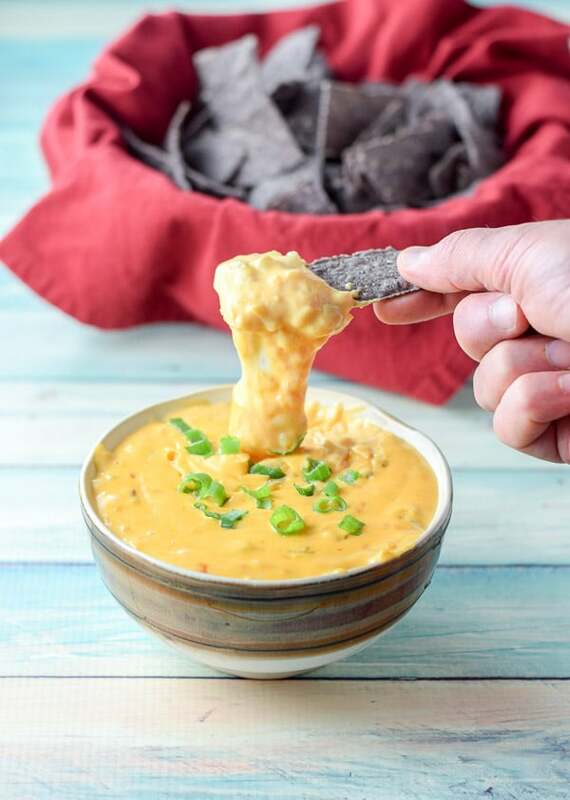 This cheese dip is so delicious and easy to make! You crack me up with your Velveeta!! It does look delicious though. I haven’t heard the Chile Con Queso story before or is it just Old Brainitis? 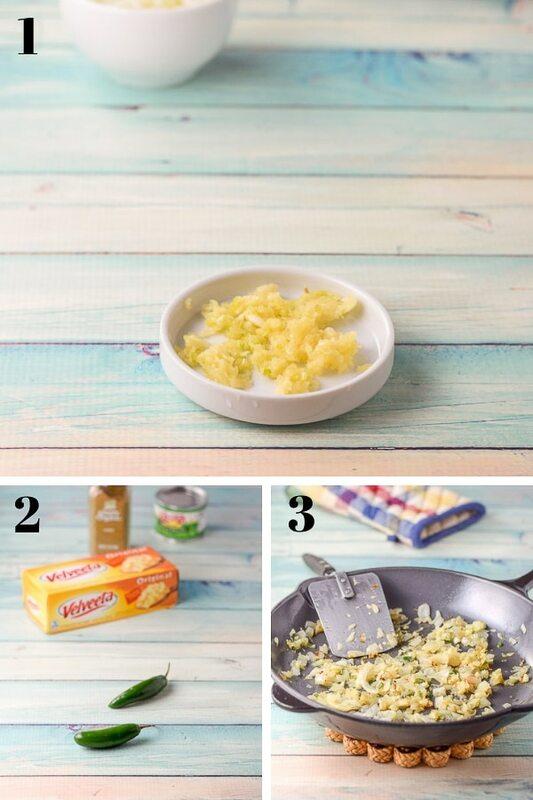 As much as I hate velvetta I do love using it like this, that looks gooey and delicious!! I totally agree about velveta. I feel guilty using it but every once in a while, I figure it’s okay!! And thanks! Perfect for this afternoon! We’re doing a Tex-Mex day!!! Yay! Very timely indeed! Happy Tex-Mex day!! Wish we were diving into this tasty dip while watching football today. It looks fantastic! Thanks Allison! Me too. It’s so yummy and decadent. I haven’t seen that type of cheese in the UK, wonder if I can buy it here? It’s a strangely delicious cheese, very processed. But oh so good melted. I grew up with it, but know it’s not the best quality. It’s usually in a grocery store but not with the other cheese, it’s sometimes on the aisle with pasta and such. I bet you could substitute a mild cheese, like Monterey Jack, or Colby with some mild cheddar. This is perfect football watching food! Pretty sure my husband would go through an entire bag of tortilla chips if I put this dip in front of him! What a great game night appetizer! I love cheese and this one looks super cheesy and easy to make ! Thanks so much. And yes, it is a great game night appetizer. And an after game snack. And a normal day appetizer and the list goes on. Sure thing. Just sent you an email! Thank you Preston! Rather than using a small onion, I make my queso with a bunch of scallions. I like the color and taste. Plus I’d have to get rid of Christopher unless he could up his chile consumption! Hehe. That sounds nice with the scallions! I like my chile con queso spicy too! Thanks Martha! Ooey gooey deliciousness on a chip. Love it! Yum. I love chile con queso! It reminds me of parties!! Great recipe!